How Will We Decide Which Planets To Terraform? Transforming another planet, moon, or other celestial body into a world fit for human habitation may be a key component of our post-Earth survival. But how will we determine which worlds should be terraformed and which should be left alone? Terraforming is just one possibility for human colonization of space. In his seminal work Terraforming: Engineering Planetary Environments, Martyn Fogg notes that a terraformed planet has certain advantages over other potential human life support systems, such as a space station or a contained biosphere: Ideally, a fully terraformed planet would require only partial monitoring and control of the system, wouldn't require a container to be built and maintained, and would have no external resupply requirements. There's also something appealing about creating a new Earth-like home for humanity. We may not discover planets or moons where we can automatically step off a spaceship and survive, but we may discover bodies that are hospitable to life—or even already contain some form of life—planets that may be ripe for terraforming. How feasible terraforming is and how we will accomplish it is an idea that will change as our technology advances and our understanding of how lifeforms are impacted by life in space and on other celestial bodies. But already, we have proposals for terraforming Mars and Venus —and out current understanding of the universe makes some celestial bodies a better target for terraforming than others. Should we terraform Venus first? One thing that we will need to learn about in our pre-terraforming colonization of our solar system is how humans and other lifeforms fare on bodies with masses and radii different from Earth's. Through enclosed habitats in other parts of our solar system, we'll learn the impact of body size on our health, and hopefully develop means of coping with life on non-Earth-seized worlds. A planet needs sufficient gravitational pull to retain an atmosphere (a key reason why the moon would be a lousy candidate for complete terraforming), but absent biological medication of lifeforms, we will also need to take a planet's surface gravity into account. Life on this planet grows and ages in Earth's surface gravity, with an acceleration of 9.8 m/s2. The bodies that we fantasize about colonizing, on the other hand, have varied gravities with their varied sizes and masses. Surface gravity on Mars, for example, is 38 percent of surface gravity on Earth. Europa's surface gravity is 13.4 percent of Earth's. Venus comes much closer at 8.87 m/s2, a surface gravity 90.5 percent of Earth's. Our understanding of how long-term changes in gravity affect the development of living beings limited to research on the effects of microgravity on astronauts and other lifeforms that have gone into space or been placed in magnetically simulated weightlessness. In humans, we've seen that life in microgravity reduces bone density, causes damage to the brain and eyes , and causes hearts to become more spherical . Flies subjected to magnetically induced weightlessness as they developed from embryos to adults saw slower development and the inhibition of gene expression related to their development, including cell signaling. Plants have successfully been grown in microgravity (despite the practical challenges involved in growing them), but changes in gravity can alter plant life as well. For example, a recent study at the University of Connecticut found that seeds produced from plants living in hypergravity have different flavors and nutritional contents than those from plants grown in standard Earth gravity. How will plants and animals be impacted by life in lower—but not micro-gravity? At this point, it's not clear. We'll have a lot to learn from human colonization of other celestial before we can answer the question of humans realistically inhabiting a terraformed body with a higher or lower surface gravity than Earth's. We'll need to determine the range of gravitational acceleration in which humans and other life forms can healthily survive. It may well be that, to live on bodies with extremely low surface gravity—such as Ceres, which has a surface gravity just 2.75 percent of Earth's—we will have to change ourselves as well as the bodies. And it may turn out that higher gravity worlds are more conducive to life than Earth-sized worlds. Rocky super-Earths, which have a mass larger than Earth's but less than Neptunes, have been found within the habitable zone of distant solar systems, and recent studies, such as one recently published by Rene Heller and John Armstrong in Astrobiology , suggests that these super-Earths might also be super-habitable . Earth-sized planets that can support life may be rarer than super-Earths that can support life, and we may need to figure out whether humans can inhabit these worlds long-term. What would the perfect planet be like? Another advantage of larger worlds over smaller ones is their surface area. A larger surface area can allow for greater biodiversity, a better bet for the long-term survival of life on the world. There is a reason that the circumstellar habitable zone is commonly referred to as the Goldilocks zone: they're not too close, not too far, just the right distance from their sun. Within this band, celestial bodies with sufficient atmospheric pressure can support liquid water at their surface. The Goldilocks zone of a star depends on that star's luminosity, and it will shift as the star ages. Our understanding of precisely where the habitable zone of our Solar System has been recently revised, and Earth may, in fact, be on the edge of the habitable zone . New research puts the habitable zone of our solar system 0.99 to 1.7 astronomical units (AU) from our sun. Ideally, a terraforming target would have a low-eccentricity orbit within the Goldilocks zone. Now it is possible that life exists outside this supposed Goldilocks zone. Water plumes on Europa , for example, suggest that liquid water exists beneath the moon's surface, and it is possible that we will find alien life there . But that doesn't mean that Europa is ideal for human life. After all, there's another problem with Europa's distance from the sun: ensuring a sufficient level irradiation for photosynthesis. Fogg estimates that undiluted sunlight could be sufficient for plant life at a distance ~50 AU from the sun, but that, at Jupiter's orbit, focusing or supplementation of sunlight would be necessary. In Terraforming: The Creating of Habitable Worlds, Martin Beech notes that some physicists have proposed using mirrors to focus sunlight on Europa and warm its surface, but the size of the mirrors needed would render that solution impractical. That's all before we contend with the fact that Europa sits in Jupiter's radiation belt, meaning that some form of radiation shielding would be necessary. It makes Mars, which sits a comfortable 1.67 from the sun, look all the more appealing. Want to terraform Venus? You'll need to deal with the Venusian day, which is 116.75 Earth days long. (By contrast, the Martian day is one Earth day plus 40 minutes.) That's a rather extreme cycle of day and night, which poses a challenge for plant and animal life. There may be an external technological solution to the Venusian day, but it would require careful control and maintenance. One proposal is to install a transparent solar shade between Venus and the sun, one where the transparency could be turned off and on in order to create an artificial cycle of night and day. Similarly, mirrors situated behind Venus would point sunlight toward the dark side of the planet. A more extreme solution is to speed up the rotation of Venus. Freeman Dyson has proposed creating a motor that would physically turn the planet, but a more likely solution is to gradually speed up Venus' rotation by crashing asteroids into the planet. But as Casey Handmer, a theoretical physics PhD candidate at CalTech, notes, such a plan would require more asteroids than are contained in our system's asteroid belt. That brings us to the question of energy and resources. Even if we have all the technology needed to terraform a world, we will need to determine how much the terraforming will cost in terms of energy and where the resources to terraform will come from. Mars has certain essential needs for terraforming: warming the planet, thickening and reformulating the atmosphere, reducing the flux of UV radiation, and making the planet's surface wet. 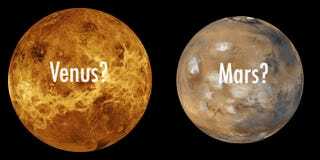 In calculating the energy required to accomplish certain terraforming goals, Handmer notes that the warming of Mars will cost considerably less in terms of energy than the cooling of Venus, and that's before you deal with the length of the Venusian day. As for the chemical resources needed for terraforming Mars, we might find those abundantly available in our own solar system. The nitrogen needed for Mars' atmosphere, for example, might be mined from the atmosphere of Titan. What this means, though, is that terraforming will change not just our target world, but other celestial bodies as well. And, if humanity reaches a point where interstellar terraforming is possible, we may have to consider not just our target world, but also the resources available nearby. Once we've reached the point where we can terraform, the question becomes should we and under what circumstances? While some advocates of terraforming, such as Robert Zubrin and Richard L. S. Taylor argue that humanity has a moral obligation to spread out onto other planets to preserve human life, transforming other worlds much as we have transformed Earth. But there may be biological or even geological features of other worlds that are worth preserving. Worlds that already host life and exist in a habitable zone—if such worlds are found—might be tempting targets for terraforming for human viability. However, should we shove aside other forms of life, even microbial life, for the sake of human habitation? When considering which worlds we will terraform, we will have to consider the cost not just to ourselves, but also to the universe.